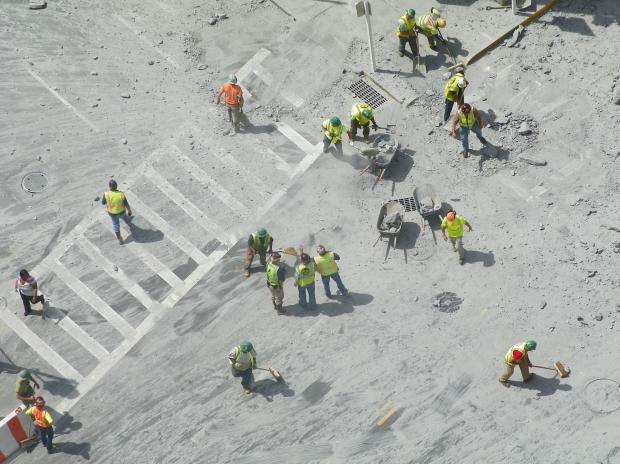 UPPER EAST SIDE — A huge blast at the Second Avenue subway construction site shattered windows and sent large rocks flying onto the sidewalk Tuesday afternoon at the corner of East 72nd Street. Firefighters rushed to the scene of the MTA's mega-project just after the 12:45 p.m. blast, which rattled residents' nerves as they felt the ground shake beneath their feet. Firefighters checked surrounding buildings as the MTA investigated what occurred at the work site, FDNY and MTA officials said. There were no injuries reported immediately. 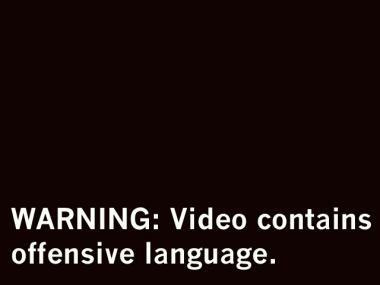 The staggering blast occurred during a controlled explosion 40 feet below the street, which was intended to carve out a slanted escalator shaft leading to the new subway line, said Adam Lisberg, the MTA's chief spokesman. 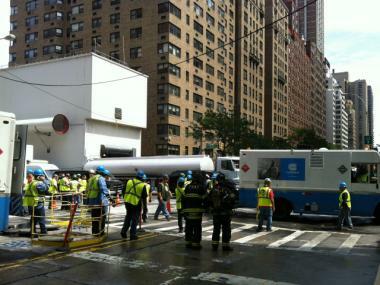 Emergency workers on scene at Second Avenue and East 72nd Street on Tuesday, Aug. 21, 2012. "We very precisely measure how much explosives to use," Lisberg said. "Something went wrong. We don't know what." Lisberg described the damage as "very minor." MTA chairman and CEO Joseph J. Lhota said the blast was "completely unacceptable" in a statement released late Tuesday. The MTA won't resume work at the site until investigators can explain what went wrong and come up with a plan for preventing similar problems in the future, Lhota said. "While I am thankful that no one was injured today, I fully understand why neighbors of the construction site are upset," Lhota said. "I am, too. The safety of the community is the MTA's utmost priority. We will continue working with the community to ensure their concerns are heard and acted upon." While blasting is common at the Second Avenue construction site, residents were alarmed by the power of Tuesday's jolt, which broke three windows at Kolb Art Gallery, on the corner of Second Avenue and East 72nd Street, a worker there said. "A big billow of black smoke came out from the corner," said Marsha Kaufman, who runs the gallery. "The whole street was covered in stones and dust." She said that "big boulders...came right at us." Aside from the three broken windows, some vases also were damaged, Kaufman said. The blast was strong enough to throw Carol Cusa, who lives in a fourth-floor apartment above the art gallery, off the chair she was sitting on in her kitchen. "I knew immediately it was something of a disaster," said Cusa, who has lived at 72nd Street and Second Avenue for 36 years. "There was debris all over the street. There were boulders, tremendous boulders, on my sidewalk.... How no one was killed is hard to believe." Upper East Side resident Susan Schuander was sitting with her back to the window at Kolb Art while making a purchase when the blast shook her off a black leather lounge chair. "I thought there was going to be another blast," said Schuander, explaining how she fell forward onto the ground. "I hit the floor. There was a very strong smell of sulfur in the air." M.D. Islam, a 37-year-old vendor who sells fruit on the corner of East 72nd Street and Second Avenue, said he felt two big explosions and saw a large stone fly 20 feet in the air. The air filled with dust and he ducked under his fruit stand. "It looked like 9/11," said Islam. "My fruit was messed up with (the) dust," he added. The massive construction project has hurt his business over the past two years, Islam said. "Business is no good. Before this, I sold $1,500, $1,200 a day. Now, only $600, $700," said Islam. "The construction is the problem. People go around a different way. There is too much dust. They are blasting every day. Too much smog," said Islam. Dynamiting for the “main cavern” of the future East 72nd Street Station, along with late night drilling, was expected to be finished by the summer, followed by blasting closer to the surface, MTA officials told residents at a Community Board 8 meeting in February.